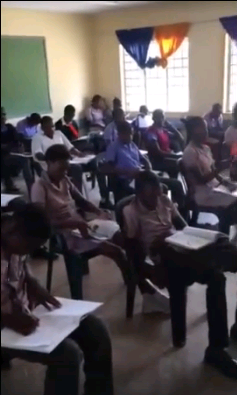 Video: Learners at Omutako Combined School sit on chairs they brought from home in class. Learners of the Omutaku Combined School in the Ohangwena Region have been told to bring their own chairs to school every day because of a shortage of vital school furniture. Apart from lack of desks and chairs, the school also lacks proper ablution facilities as the existing facilities are falling apart and is deemed to be too dangerous to use. According to the school principal, Lucia Haulofu, some of the problems date as far back as 2016. Since then learners are required to carry their own plastic chairs from home to school every day. Those without chairs have to find an alternative or simply sit on the floor. 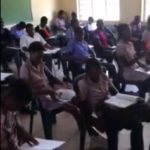 “Currently, the learners sit on their own chairs which they carry from their houses. We had not choice but to request them to bring it along to keep the children from siting on the floor,” said Haulofu. Haulofu added that the school requested for assistance from government a long time ago, however until now nothing has been done, despite promises of a helping hand. She added that the school needs more than 200 desks and chairs in order to reduce the problem. Even then all the problems would not be solved. Haulofu noted that the situation keeps worsening every year as school enrollment also keeps on increasing. The school has a total of 775 learners enrolled from pre-primary to grade 9. “A lot of desks and chairs are too old and in to bad a condition to be used by the children,” said Haulofu, adding that all they can do is pray and hope that sponsors and donors would come on board and assist. Director of Education in the Region, Isaack Hamatwi stated that the backlog is not only experienced at the Omutaku Combined School, but in many other schools in the Ohangwena Region. “We have issued tenders for the chairs and desks, but those chairs and desks will still not be enough for all the schools,” said Hamatwi, adding that currently they are only able to supply 80 desks and chairs to two new classroom blocks built at Omutaku. Hamatwi added that their hope is for Good Samaritans to come on board and assist.